Silk mat / Pattu paai / Pattamadai Pai (mat) is a beautifully crafted floor mat.Every tamil family would be familiar with the pattu paai and may have had one at home. Pattamadai is the neighbour village to Cheranmahadevi, ranges about 3 Kilometers from Cheranmahadevi and 20 Kilometers from Tirunelveli in Tamilnadu ..India. Patamadai resides along the banks of the river Tamaraparani. It is world famous for its silken mats woven from grass. The majority of mats made in here have cotton warps and korai wefts. Korai belongs to the sedge family of plants, Cyperaceae. Korai mats may be broadly divided into three categories. Coarse mats are rough in texture, relatively quick to weave and may be made using either a handloom or powerloom. Higher quality handloom mats are finer in texture. The highest quality have a texture akin to silk. To make such mats the korai is soaked in running water for up to a week until it begins to rot, the central pith is then scraped off and each stem split into fine strands, dried and dyed. The finer the mat desired, the longer the korai needs to soak and the thinner the weft strands will be. The number of warp threads also increases with finer mats. Apart from the regular weaves and patterns, Pattamadai paais are made to order for wedding ceremonies. The bride and the groom's names and the wedding date are woven in to the mat make the occasion memorable. This particular handicraft is original to Pattamaadai, a small village in Thirunelveli district of Tamil Naadu, and hence its name. It is also called Korai or Gorai paai as it is made of a special kind of grass called "Korai/Gorai". The process of mat weaving is time consuming and painstaking. The art and craft of weaving and blending intricate designs of Pattamadai mats are considered unique to this region. "Korai' grass grows in swampy lands and riverbeds. Conventional method of mat making involves lengthy processes of drying, soaking, splitting and dyeing the grass. The harvest season fall during the months of September/ October and February/March . The grass is cut while it is still green. Strips of grass are sun-dried and are not to exposed to humidity as they tend to turn black with the exposure. As the dried grass strips turn a yellowish green, they are boiled in a pot of water and then dried again. Bundles of dried grass are then soaked in running water and kept below the surface of the water for three to seven days. This process makes the grass to swell up to three times its original size. After it is then dried again and then taken to a floor loom. Finally a woven mat is dried in the sun for a short time before being polished. There are three different categories of the silk mat available in the market and the classification depends on the weave: Coarse weave, medium and the fine weave. The outer skins of the grass is stripped to bring out the fine strand from within for weaving the finer variety. 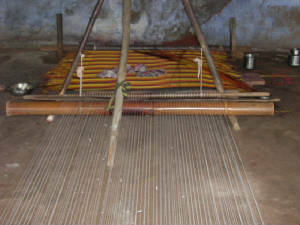 The loom which consists of a warp supported by the mukali (means a tripod - in tamil )(a bamboo tripod). The weft of korai strands is inserted in the needle and made to pass over and under the warp of starched cotton threads according to the design, very similar to the process of weaving fabric. Water is used to soften the grass throughout the process. In the picture below, you can see the supportive mukali and the mat (a work-in-progress) on the floor. Traditional colours include rich "Indian" colours : black , brown and red as these are the colours derived from sappan tree. Dyed grass strands are woven into bold stripe patterns with a thick set of streaks on both ends to make conventional looking mats. Beautiful traditional motifs and designs bring out the luxurious look of these mats. I prefer the natural scent of these mats to the stinky plastic odor any day! Traditionally, woven on hand-looms, these mats are now mass produced on power looms to meet domestic and international demand.These beautiful mats are weaved using cotton or silk in the weft. Predominant use of silk (pattu) thread for weaving gave it its other name - Silk mat or pattu paai. Use of silk thread gives a royal sheen and definite appeal to the mat. Look at the beautiful custom silk border in this mat ! The mat industry has gone through a cycle of transition from being most coveted to the most ignored and then back in demand. Efforts by a few organizations to promote this handicraft led to an influx of commercial interests. This cycle doesn't benefit any craft/art form, and the same applies to the Pattamadai mats industry as well. Commercial weaving over the years have led to increased use of pure cotton and nylon threads instead of silk thread.Increased domestic and international Demand and supply imbalance eventually led to increased use of synthetic dyes, shorter product life cycles, and lesser focus on long term benefits for the weaver and the industry as a whole. Off late, eco-conservationist organizations have taken interest in this matter and a few of these production houses are reverting back to traditional methods of dyeing and processing of the Korai grass. Efforts are being made by organizations in promoting use of natural dyes and motivating weavers. Life is all about making right choices. One as simple as buying your yoga mat can make a difference on your carbon footprint. Do you know that a standard mat sold as being suitable for yoga is made of soft PVC (Poly Vinyl Chloride) a non earth friendly non bio degradable material. You must have noticed a strange stinky odour emanating out of a plastic mat, slipper or a bag for that matter. Imagine all the fumes this mat may be releasing into the air and its impact on air quality with in your house.Why live that way when you can make smart eco-friendly choices? Keeping in tune with the current trend, the best we could do is to make earth friendly choices. Opt for a grass, straw, Palmyra leaf, cane, sea grass or a banana fiber mat. Buying these you would not only make a green choice, you would also be promoting local handicrafts depending on where you live. Because, every culture has something to which is local to that region. 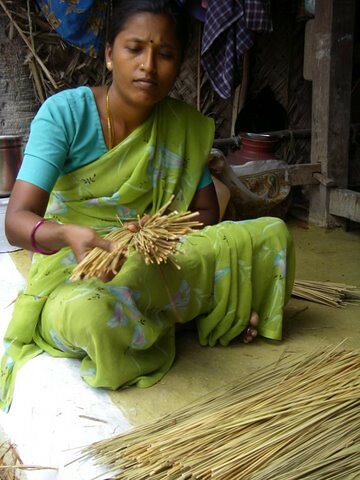 For example, we have at least 20 different grass or straw mat varieties available in India alone. I need wedding mat .can i have the phone to contact . I would like to know if you have an outlet in Chennai? Hi…want to purchase river grass products. ..let me know how to contact u at the earliest. ..
Hi. I need the silk boarder pattu mat. Please let me know how can I get that and price of the same.